Aidy Boothroyd – Football Genius or Long Ball Dinosaur? Aidy Boothroyd was once, somewhat tongue in cheek, described as a football genius. Putting this as a search in Google brings up a YouTube clip of the same name.The video itself is of an infamous scuffle between Boothroyd and Crystal Palace defender Fitz Hall during the Play Off Semi Final in 2006 which was more comedy than genius. Nevertheless, it came at a time when Boothroyd was seen as a footballing miracle worker, lifting an unfancied Watford team into the Premier League despite lacking the funds of many of the other teams in the league, and himself being one of the youngest managers in the league. Since the heights of 2006, the trend in Boothroyd’s career seems to be generally downward, until his return from the depths in 2014 to become England under 20’s coach, in a move seen by many as nepotistic by critics, with Boothroyd previously working closely with the FA’s Technical Director, Dan Ashworth. Had the England appointment been made around the time of his wonder years at Watford, it may well have been welcomed as forward thinking. The Yorkshireman was appointed at Watford late in the 2004-5 season, replacing the current England coach Ray Lewington, and was virtually unheard of outside of any clubs at which he’d played or coached. With the club in danger of relegation into the third tier, fans and pundits alike were baffled by the decision to remove an experienced coach and replace him with someone of so little experience. Nevertheless, the new manager, who gained an early reputation for positivity, kept the Hertfordshire club up, and then targeted promotion for the following season. Even the players were surprised at their manager’s optimism, however they did indeed gain promotion via the Play-Offs, conceding no goals in two games with Palace and the final against Boothroyd’s former club Leeds. An exciting young side had been built, including future England talents in Ben Foster and Ashley Young, emerging American Jay DeMerit, and revitalising the career of Marlon King. The Premier League was, as Boothroyd was later to acknowledge, a much bigger challenge, and it is here that things started to unravel. Critics of the style of play became louder, and questioning began on the quality of some of Boothroyd’s signings. There were also apparent fall outs with players, coaches and directors, and there was talk that the Watford manager’s positivity was turning into arrogance. Following the inevitable relegation, Watford started the Championship season as pace setters and at one stage were 12 points clear at the top of the table, but they lost form badly and finished the season limping into sixth place and the Play-Offs, before being hammered over two legs by eventual winners Hull City. Boothroyd had shelled out a club record fee to bring striker Nathan Ellington to the club, however the player became a financial burden with little contribution on the pitch. Boothroyd in a more recent interview claimed that many at the club lost their desire, becoming “fat and happy”, and Ellington was the epitome of the problem. With the club in financial trouble following excessive spending by the manager on players and staff, the cut backs began, and Boothroyd survived only until the following November. Having been interviewed for several managerial positions, Aidy Boothroyd finally returned to football nearly a year later at League One Colchester United, who had recently seen their manager Paul Lambert jump ship to rivals Norwich City. Despite early promise and a top six position, poor form saw Boothroyd’s side finish eighth. With the manager promising to make changes to the squad, it was him who was one of the first out the door with the offer to move back to familiar Championship territory with Coventry City. After another promising start, including a fight back to earn a 2-2 draw at Watford, where he was given a huge ovation from the home support, a poor run of form saw him sacked the following March. Boothroyd’s latest club managerial role started the following November, as he took the reins at Northampton Town, who were at the foot of the Football League. Boothroyd guided the club to safety, then led them to the Play-Offs the following season where they lost in the final to Bradford City. The following season was back to a struggle, and the manager was sacked just before Christmas with the club again at the bottom of the Football League. The man touted as a future England manager had seen his reputation crumble in seven years. There seems to be a fair split of opinion on the coaching abilities of Aidy Boothroyd. I remember my FA Level II coaching course, our tutor asked us to name our coaching influences. A lad on the course who had played in Peterborough United’s youth set up named Boothroyd, with the tutor acknowledging that the former Leeds United coach’s sessions were “a different class”. Several players coached or managed by Boothroyd have backed this up, with his infectious enthusiasm contributing to an enjoyable environment. Others have labelled him as one dimensional, with his use of a direct playing style at the clubs at which he’s managed. Boothroyd has since stated that he simply uses the tactics which bring the best out of the players. While once irritated by the nickname of “Hoofroyd”, he has embraced the opportunity with England as one where he can grow as a person and as a coach. Having formerly put together the technical programmes for youth set-ups at the likes of Peterborough, Norwich and West Brom, he is excited to be involved with the rebuilding of the England DNA at St George’s Park. I was therefore very keen to see the man in action myself and he was involved in several sessions and seminars at the FA Coaches Club Conference in December 2014. The session I observed was part of the England DNA demonstration of the philosophy when out of possession, where the aim is to regain the ball “intelligently and as early and as efficiently as possible”. England teams should be looking to press, if unable to then to delay, deny and dictate, and finally emergency defending. The England under 20’s head coach put on a session which explored all the elements, and it was his positivity and enthusiasm which came out through the session. He was loud in his praise of everything, and would have quiet chats to bring out any coaching points, usually asking an individual how they could have done things differently, or whether there was anything they felt their team could improve on. He mentioned after the session that he prefers to have a quiet word if everything is generally running smoothly, and will only do the standard “Stop, Stand Still” if everything is all over the place. Boothroyd also encouraged the players to think for themselves, from asking teams to elect a captain in each exercise, making each play accountable for their responsibilities, and getting them to decide tactically how they were going to approach the challenge. Every instruction was clear and delivered with his well known deprecating sense of humour. If there is arrogance about Boothroyd, he certainly doesn’t show it on the pitch. The session itself started with an warm up exercise involving the use of hands rather than feet. This is a regular method I have observed coaches use to ensure that the players are thinking about things away from the ball – positioning, communication etc… Having moved the warm up on to using the feet, but again questioning them on the decisions they are making, the session moves on to a larger practice where one team looked to play out from the back, while the other team looked to press and win the ball back, focusing on being well organised defensively while also being able to make quick transitions and counter attack quickly. The session then moves on to a couple of 11 v 11 practices, one where a team is defending against a counter attacking team and requiring use of the delay, deny and dictate principles, and then where Boothroyd randomly drops a new football in different areas to test the team’s ability to organise quickly in emergency situations. He encouraged teams to think about defending while attacking, and similarly have attacking thoughts while defending. 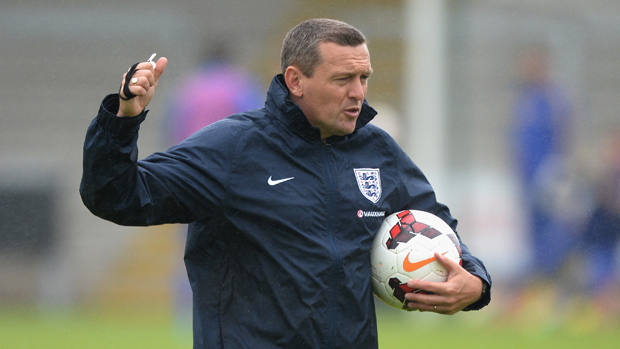 Boothroyd has moved on from coaching the under 20 age group to now look after the England u19s. He appreciates the reason for the criticism and the perception that his coaching does not produce attractive football and understands that it will time to lose the stigma of being tactically one dimensional. He has also shown slightly more humility in admitting to errors he made in the past, and has shown as head coach of two of England’s younger age groups that not only can he get the results, but also do so with a far more attractive style of play. Although obviously enjoying his role with the national team, he admits he would be keen to return to club management at some point in the future. Will he ever be seen as a football genius again? Only time will tell. If you encounter any difficulties with this blog listing then please feel free to report the problem to us so that we can keep the Football Blog Directory up to date. We do our best to check the site for dead or inaccurate links on a regular basis. However, from time to time blogs can be deleted or domain names can expire. If the link on this listing is no longer working, or if you feel that the listing no longer accurately reflects the content of the blog, then please fill in the form below to report the problem. If you are the owner of the blog featured on this page, and would like to have your blog details updated, then please feel free to contact us using the blog submission form on the contact page. Please remember to tick the box stating that the submission is for an update rather than a new listing, and then include all of the new information that you would like added to the page. Automatic Promotion - Who Wants A Slice Of The Premier Pie? Has the FA Cup Runneth Dry? 5 Reasons Why Chelsea Have Been Terrible This Season! Throughout the football season we run two prediction games. The Premier League Prediction Game Of Destiny and Doom is a league competition run monthly. This means that you can join up at any stage of the season and still be in with a chance of winning. We also run an FA Cup Prediction Game which, for simplicity, runs from the 3rd round of the FA Cup. This is a knockout competion open to all. The Game starts with group stages for rounds 3 and 4, before reverting to a simple knockout process from round 5. Sign up for either game by visiting our Prediction Games page.